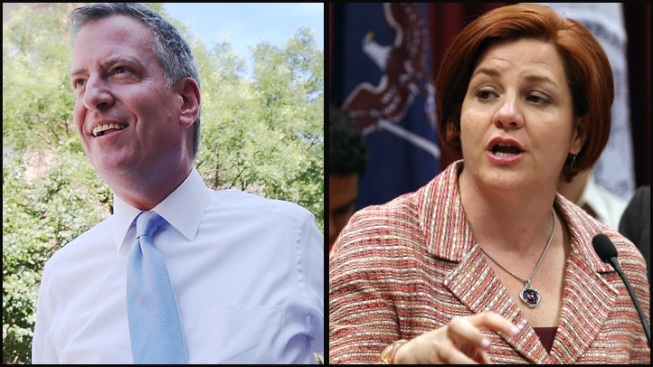 The topsy-turvy race for New York's Democratic mayoral nomination has shifted again, with Public Advocate Bill de Blasio surging to a statistical tie with City Council Speaker Christine Quinn and former comptroller Bill Thompson in striking distance, a new poll shows. Disgraced former New York Rep. Anthony Weiner, meanwhile, has been unable to stanch the fallout from his admission last month that his online sexual relationships with women continued after he resigned from Congress in 2011. In a few short weeks, Weiner dropped from first to an apparent fourth place spot, according to the NBC 4 New York/Wall Street Journal/Marist Poll. The poll, conducted Monday through Wednesday, found Quinn's support at 24 percent, statistically unchanged from the last poll in July. De Blasio jumped to 21 percent from 14 percent. Thompson followed at 16 percent, just a couple points higher from July, and Weiner dropped to 12 percent from 16 percent. Comptroller John Liu, Bronx Pastor Erick Salgado and former City Councilman Sal Albanese remained stuck in the back of the pack. The poll of 679 registered Democrats has a plus or minus 3.8 percentage point margin of error. As Weiner flounders, the race's momentum has turned in favor of de Blasio, a liberal, outspoken critic of Mayor Michael Bloomberg and New York's policing tactics -- particularly stop-and-frisk, which a federal judge deemed unconstitutional this week. De Blasio's turnaround is due in part to a swell of support from black voters; 20 percent of black Democrats said they'd vote for him, up from 10 percent last month. His surge in the polls has come as he has sought to showcase his racially mixed family on the trail, and released an ad narrated by his teenage son, Dante. Thompson, the only black candidate in the race, has the support of 22 percent of black Democrats, the poll found. De Blasio now stands as the race's best-liked candidate, with 59 percent of Democrats saying they had a favorable impression of him, and 14 percent saying they didn't. Quinn, by contrast, has seen her image deteriorate. Once the clear front-runner, she is the Democratic candidate with the closest association with Bloomberg, and now suffers from a rising unfavorability rating. In February, 17 percent of Democrats said they didn't think positively of her; this week, the number jumped to 32. Still, 54 percent of Democrats said they had a favorable impression of her. And then there's Weiner, who has hit an all-time low: 26 percent of Democrats said they thought highly of him, and 63 percent said they did not. That's quite a fall since June, when a NBC 4 New York/Wall Street Journal/Marist Poll showed Weiner leading the primary field. Back then, 52 percent of Democrats said they had a favorable impression of him, and 36 percent did not. With the Sept. 10 primary drawing closer, and small margins separating the leading candidates, it seems likely that none will receive the 40 percent of votes needed to avoid an Oct. 1 runoff. The campaign also appears vulnerable to more dramatic swings: only 43 percent of Democrats said they were firmly committed to their choice of candidates. "There is still a large group of persuadable voters," said Lee Miringoff, director of the Marist College Institute for Public Opinion. "Voters are still having a difficult time sorting this all out." The poll asked voters to pick who they'd vote for in various runoff scenarios. In a race between de Blasio and Quinn, the two candidates came out in a statistical tie, 44 percent to 42 percent. The results weren't much different in a hypothetical matchup between Thompson and Quinn: 44 percent to 43 percent. Asked to choose between de Blasio and Thompson, respondents picked de Blasio, 44 percent to 36 percent. This was the first NBC 4 New York/Wall Street Journal/Marist Poll in which Quinn didn't earn a larger percentage than any rival in a potential runoff. In the race for the Republican nomination, Joseph Lhota, a former MTA chairman and aide to Mayor Rudy Giuliani, led billionaire businessman John Catsimatidis, 33 percent to 22 percent, according to the new poll. Homelessness-services nonprofit head George McDonald was in third with 12 percent. Nearly a third of registered voters surveyed said they were undecided. The Republican numbers are the result of answers from 132 GOP-registered New Yorkers, a relatively small sample that carries a plus or minus 8.5 percentage point margin of error. Because Republicans don't seem very focused on their party's primary, the race remains "subject to potential movement of a large nature," Miringoff said. The NBC 4 New York/Wall Street Journal/Marist Poll also surveyed the fields in undercard city races. In the Democratic primary race for comptroller, former Gov. Eliot Spitzer widened his lead over Manhattan Borough President Scott Stringer, to 56 percent to 34 percent. A large proportion of that lead is due to overwhelming support from blacks and Latinos, Miringoff said. The Democratic primary race for public advocate remains difficult to assess. More than half of Democrats said they were undecided, and the leading candidate, City Councilwoman Letitia James, received 16 percent of respondents' support. Her closest rival was university professor Catherine Guerriero at 12 percent. Rounding out the field were state Sen. Daniel Squadron (9 percent), former deputy public advocate Reshma Saujani (3 percent) and civilian police official Sidique Wai (2 percent).